Eight months after 9/11, a ceremony was held to mark the end of the recovery and cleanup efforts of The World Trade Center. That same month in 2002, ground was broken on 7 World Trade Center, the first tower of a 16-acre complex of buildings occupying the site where the original structures had stood. Construction on the 52-story building began without delay, and it opened in May of 2006. New York City’s most famous real estate location is nothing new for Ellison Bronze. 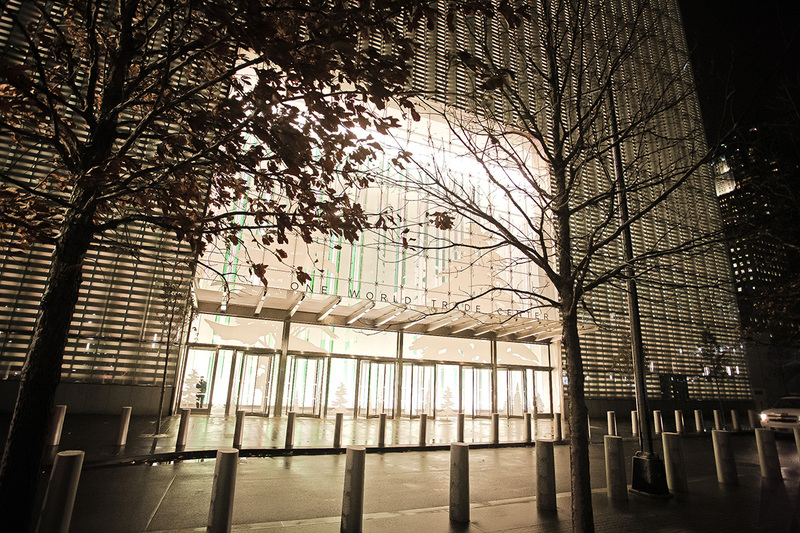 Forty-six of the company’s balanced doors graced the original WTC complex – and for this rebirth, Ellison Bronze doors again welcome occupants and visitors in three of the buildings, with more to come. “The World Trade Center is known throughout the world as one of America’s landmarks, and we’re proud that Ellison balanced doors have again been chosen to help represent that,” says Mark Graves, President of Ellison Bronze. 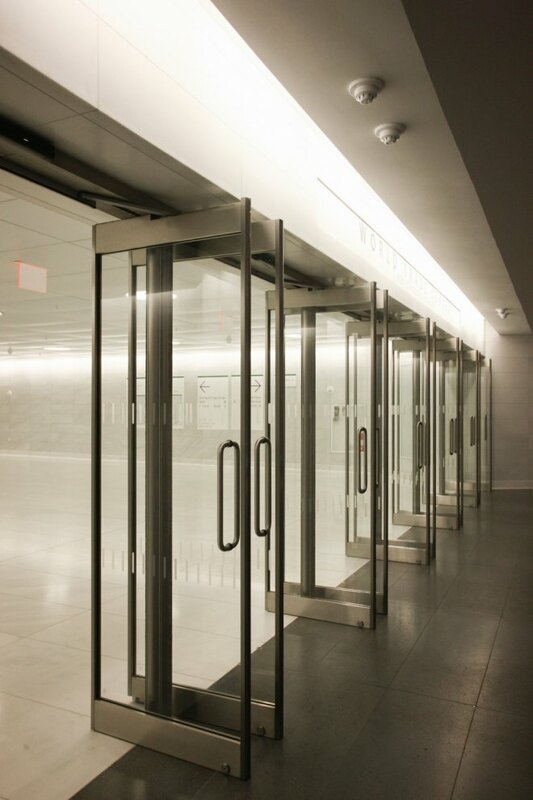 The entrance of 7 World Trade Center features two stainless steel Ellison balanced doors with narrow stiles that act as alternate entries to revolving doors at the main entrance. The narrow stiles allow for the maximum amount of glass to be used and the doors themselves have a satin finish that complements the building’s stainless steel façade. The combination of sleek stainless steel and glass creates a modern streamlined look that allows natural light to enter the building, giving an open feel. Ellison balanced door systems not only satisfy aesthetic goals, but they also allow for large and heavy doors to be opened with ease. All Ellison balanced doors offer a more fluid range of motion, despite the added weight of a sturdy frame, door leaf, and balanced hardware. Resulting in a harmony of form and function, the opening motion of all doors remains effortless when opened manually or with a power operator. "Ellison balanced door systems are great for any entry where quality counts," says Joseph Dai, President of MacKenzie Door Company, who represented Ellison. "Ellison can match any style, and the time-tested materials withstand high foot traffic and any weather condition, and will last long into the future." The centerpiece of the new World Trade Center complex opened in November 2014. Originally referred to as Freedom Tower, One World Trade Center stands 104 stories high, the tallest skyscraper in the Western Hemisphere. 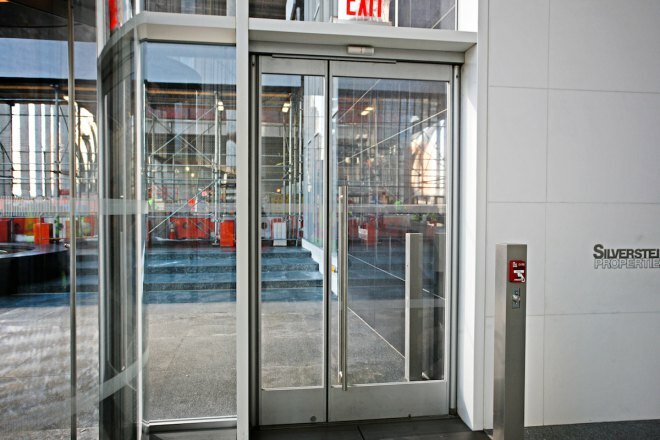 It is outfitted with 12 Ellison balanced doors that bear a similar appearance to those of 7 World Trade Center: stainless steel with narrow stiles and the same satin finish. The tower also showcases LED lights that illuminate the base at night, and cable-net glass facades on all four sides of the higher floors to create a cohesive look consistent with all of the other buildings at the site. Both buildings, One World Trade Center and 7 World Trade Center, were designed by architect David Childs of Skidmore, Owings & Merrill (SOM). The third tower to feature Ellison balanced doors is 4 World Trade Center. Under architect Fumihiko Maki’s designs for the 78-story building, 19 Ellison doors were installed. 4 World Trade Center will also provide access to the World Trade Center Transportation Hub, an underground retail and transportation concourse that will be connected to the Port Authority Trans-Hudson (PATH) rail system, 11 subway lines, Battery Park City Ferry Terminal, the World Trade Center Memorial Site, Towers 1, 2, 3, and 4, the World Financial Center, and the Winter Garden. To date, one of the entries into this underground concourse features six pairs of Ellison balanced doors. Plans call for additional Ellison doors in the Oculus, the upper portion of the Transportation Hub that serves as the main concourse. Construction continues on the WTC project under the supervision of the project team: developer Silverstein Properties, architect David Childs (of Skidmore, Owings & Merrill) and architect Daniel Libeskind (of Studio Daniel Libeskind). Additional Ellison doors will be installed as progress is made on current and future structures of the WTC complex. Ellison Bronze, Inc. has been in business for more than a century and has been a part of many prestigious undertakings. But this one is different, producing a reaction as precise and effortless as the operation of its doors. "We are honored to be a part of this iconic project," says Mark Graves.